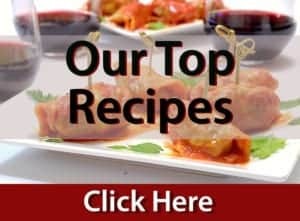 One of the benefits of writing about food is being asked by others to come up with new recipes. 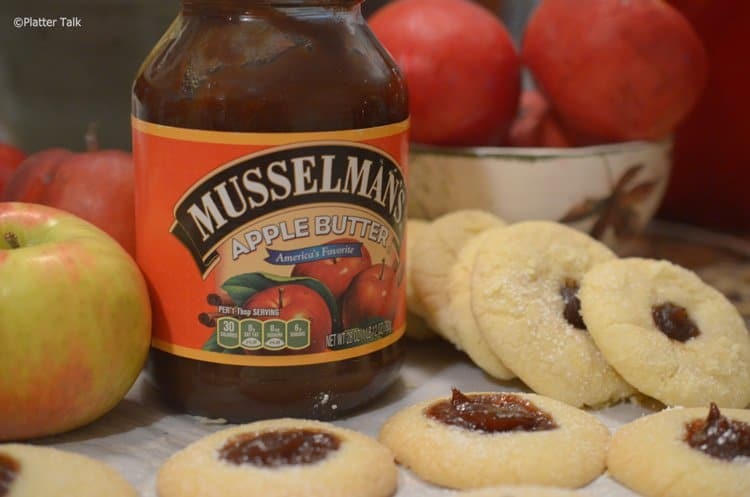 A month or so back, a kind lady from Musselman’s emailed me and offered to send me a bottle of Musselman’s Apple Butter so that I could come up with a tasty new use for it. 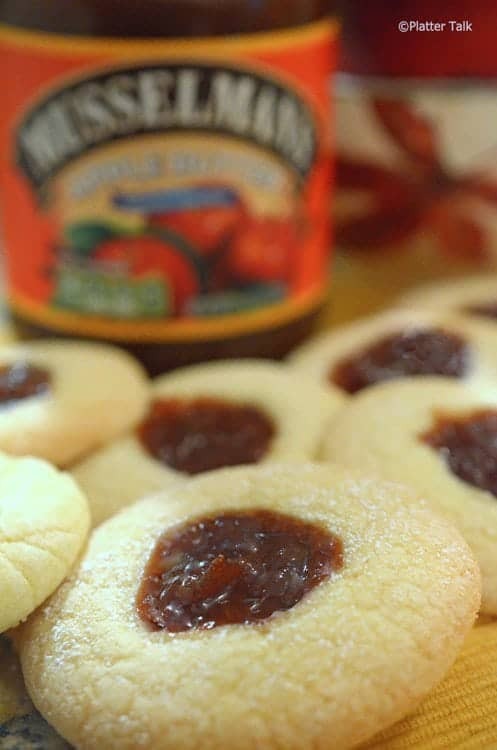 I eagerly agreed to do my best and as a result of my own cravings and a little bit of creativity, these Scottish Tea Cookies with Apple Butter were born. I’m only beginning to appreciate apple butter. I grew up enjoying it although it seems it was only around after trips to visit family in Ontario, Canada which was a short two hour drive or so from my childhood home in the foothills of New York state’s Adirondack mountains. To this day, I haven’t figured out why there seemed to be no local source of apple butter in those parts. As time goes on though I’m beginning so surmise it was a great excuse of my mom and dad to pay visits to their dear cousins who lived north of the border. The Good people from Musselman’s Apple Butter are offering a free jar of their apple butter to one lucky follower of Platter Talk. Details and entry information follow below. Good luck! Combine salt, sugar, shortening and butter. Add flour a bit at a time, working in like a pastry to a crumbly consistency. In separate bowl, beat eggs and and vanilla. Add egg mixture to flour mixture and mix till smooth. Chill dough in fridge for at least one hour. Shape chilled dough into balls 1 inch in diameter. Place dough balls on greased baking sheet about 2 inches apart and flatten with palm of hand. Use thumb to create well in center of each cookie. Place a few tablespoons of apple butter in small zip-lock bag. Snip corner of bag with scissors to create small opening. Squeeze apple butter into each well, filling slightly above level of dough. Bake at 350 degrees F for 20 minutes or until light brown in color. 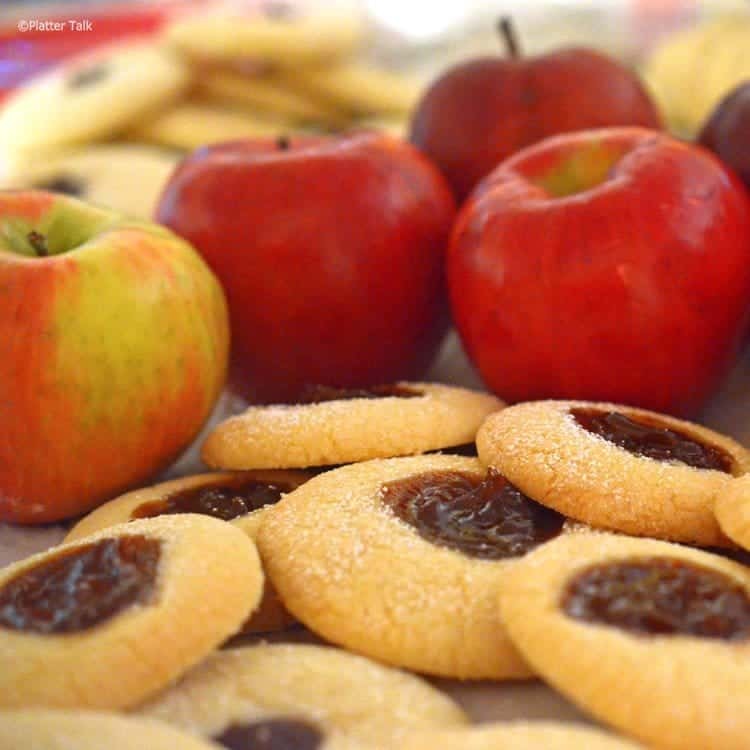 Oh my gosh, these cookies look too delicious. Never even heard of apple butter until coming across this post. Will definitely need to check that out. Thanks! Peter, I hope you try the cookies AND some apple butter! Thanks for the great comments. These cookies are so pretty. 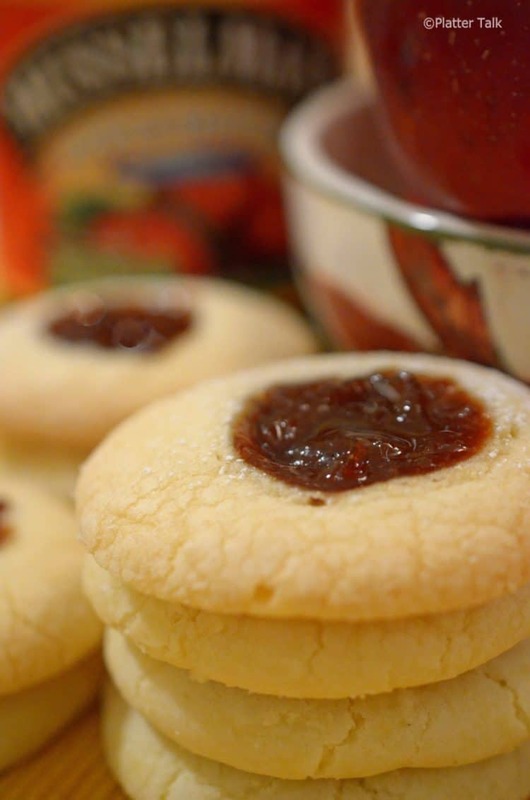 I love that you used apple butter, rather than jelly. You are being featured this week, at Simple Supper Tuesday. I hope you can join us again, starting at 8pm, on Monday night! I love it on a nice warm buttery biscuit, or….in a spoon straight to the mouth!! 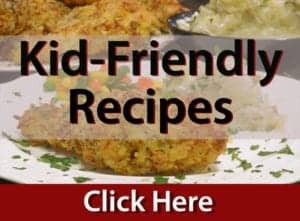 I really love the Apple Butter Meatloaf recipe! I like it on toast, with butter.